With the hot weather set to return this week, The Royal Parks' contractor, Park Deckchairs is getting ready for the rush by ordering in over two miles worth of new canvas for its chairs. With increased visitor numbers during the July heatwave, the deckchairs throughout the Royal Parks have been well used, calling for Park Deckchairs to invest in 4.7 kilometres of new material - the equivalent distance to one lap of the Outer Circle of Regent's Park. Park Deckchairs operate throughout the inner London Royal Parks each summer, giving visitors the chance to kick back and relax whilst enjoying all the parks have to offer, from boat hire in Hyde Park to the country's largest free to view waterfowl collection in Regent's Park. The new material will be used to cover 6,720 chairs, with the old green and white striped canvas being recycled into reusable bags. "Due to the fantastic weather we have seen an increase in deckchair usage this summer, which is great! "We normally replace our canvas once a year at the end of the season but because of the popularity of the chairs this year we have had to bring that forward. We have seen the weather forecast for this week and it looks great so we are encouraging everyone to get out and enjoy the parks." "The weather has been great this summer and it has reflected positively in visitor numbers which has led to our concessions doing very well. "During the hot spell in July ice cream sales doubled in Hyde Park, St James's Park and Green Park compared to the same time last year. And due to a combination of the July heatwave and our Barclaycard presents British Summer Time Hyde Park event our website traffic reached an all time peak of 302,593 with over 3.4 million people seeing Hyde Park content on Facebook. "Park Deckchairs have seen a rise in numbers and hopefully this weekend many more visitors will come and enjoy everything the Royal Parks have to offer." 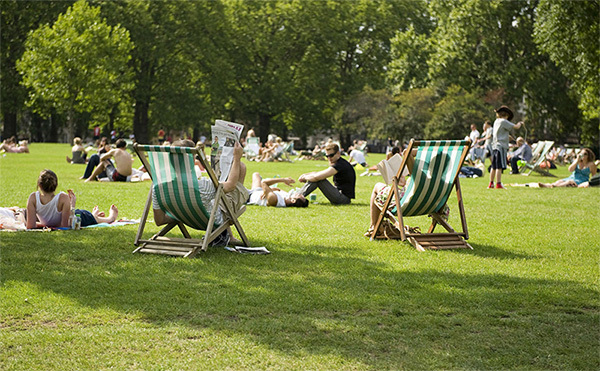 Deckchairs can be hired in Hyde Park, The Regent's Park, St James's Park, Green Park and Kensington Gardens from £1.50 per hour throughout the summer months.